[New for Summer 2015] With so many companies putting out their summer flavors from previous years, it's nice to see Friendlys giving us something new. This one even donates part of the proceeds to Easter Seals Camp Friendly's program. Win Win! I know it's hard to tell, but I like that the color is off white. I'm so tired of "toasted" marshmallow flavors that are blinding white. Sorry, getting hung up on visuals as always. Ok, I already snuck a few bites as I was scooping myself a bowl but let's grab a few more. Ok, definitely marshmallow flavor. Enjoying the swirl. Chocolate Chips to finish it off. I know this won't shock you, but I like it ofcourse. Come on, when do we not like a smores flavor here? Sorry, but I kind of finished off my small bowl before typing any more thoughts. I could blame the fact that it seemed to be melting fairly quickly, or I could blame my addiction to graham swirls. Either way, it's gone and I'm happy. Is it perfect? No, I wouldn't go that far, but I'll definitely be repurchasing it. What's bugging me? Well, not bug, but keeping this from perfection? Well, one is the texture. There's almost a bit of... gumminess or something strange going on here. 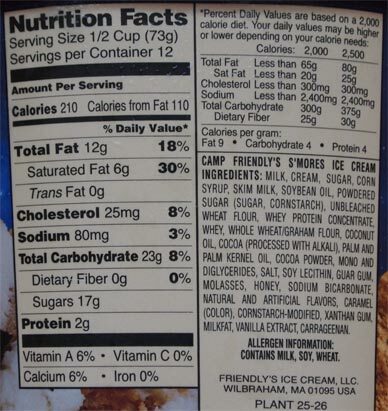 I actually checked the container to make sure it wasn't a frozen dairy dessert. The other thing a little off is the flavor. It's not perfectly balanced, but when it comes to graham, I don't need perfection, I just something good, and we have that. Ok, I went back to the container for a few more bites. There's definitely an airiness to the base ice cream that's unlike their regular premium ice creams. It's just a little too unnaturally smooth. (ahhh, most people won't notice this, just being me here). Favorite part? Well, I really enjoy the swirl. It's not to dry, not too sugary, not too sweet, just squarely in the middle and very pleasant. Part of me wants to eat it while it's intact, but there's a neat bit of magic that happens when the swirl blends evenly with the base. It just really comes alive with texture and flavor and those are probably the best bites. 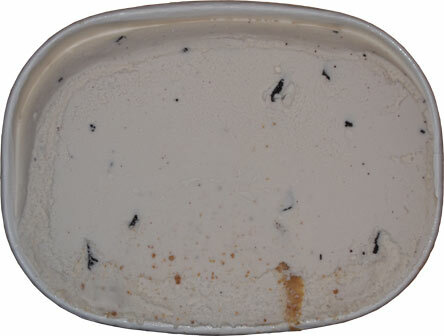 On Second Scoop: Oh man, I am so full of s'mores ice cream right now (a reward for some late day mowing). 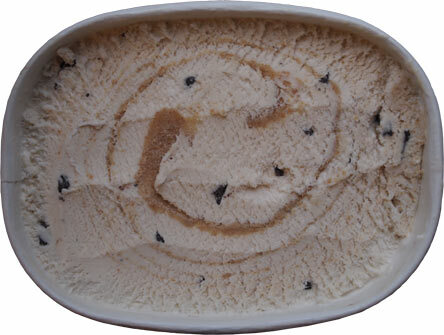 I am addicted to graham swirls and this one has that. What can I say. Overall a nice flavor. Definitely an overall s'mores vibe to it. Maybe not dead on, there is a bit of fakeness to it, but it's still in a happy place. I'm not really describing anything am I? Basically it has enough of everything, enough swirl, enough marshmallow, and enough chips so you won't feel jipped. My only suggestion here is to let it melt a bit because like I thought yesterday, once the graham spreads out a bit, things really start to pop, at least if graham is the main reason you came to this flavor. Definitely buying this one again. 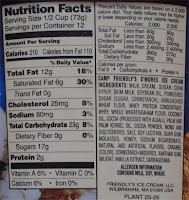 Is there a difference between flakes and chips? Wish I had Friendly's here, but I'll have to stick with Kroger's version (which has a fair amount of crunch for an ice cream). Semantics really. They are a decent size in this instance, I should probably photograph a few of them. Perhaps not a big deal, but I love the cool packaging design of this container! What is the swirl? Liquified graham cracker magic? Actual graham bits drizzled in? Strange concoction of...something...that tastes like graham? @Dana: it's not straight up graham, but not a liquid either, it's in the middle. Not too salty or sugary. Middle of the road as I say too often. I bought 2 of these when they were on sale hoping they would be good. I too love a graham cracker swirl. So excited you reviewed and liked them. I just bought this today. 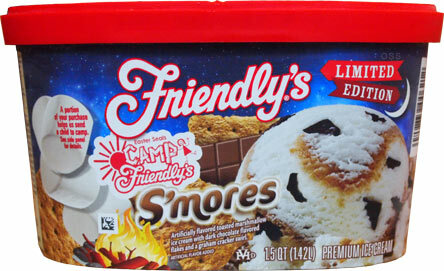 I love it just because it makes me want to repurchase it and there just aren't many Friendlys products that I like, outside of their Birthday Cake flavor. Giffords Campfire Smores is my favorite but Gelato Fiasco's Toasted Marshmallow takes the top prize. Giant has Friendy's for $1.99 this week so I bought this flavor, Rockin' Poppin' Cotton Candy, & Vanilla Pineapple. This is very good, you should buy it if its available. It didn't ;last a day at my house.